pre-dawn «Suad Bejtovic Photography etc. Suad Bejtovic Photography etc. April 6 is the anniversary of the liberation of my home town from German forces in World War II. Around the same time of the year, a more somber anniversary is observed in the city, that of the Siege of Sarajevo, the longest siege in modern warfare. With this post, I’m making a small contribution in marking these anniversaries. 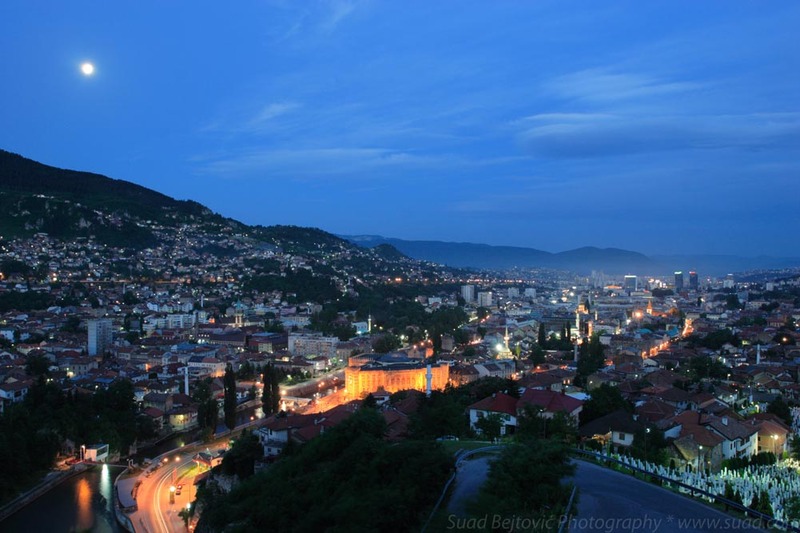 This shot was taken during my June 2009 visit to Sarajevo; it’s still one of my favorite trips, partly because it extended to a few days in Dubrovnik, Croatia, but mainly because I spent it in the company of all my dearest family members. I wanted to finally take some good sunrise and sunset shots of the city from some of the many hills surrounding it. The trouble with that plan is that the days in the middle of June are really long, and the dawn breaks as early as 4 a.m.
After a few days of recovering from jet lag, I got up really early this one morning (this was taken around 4:35 a.m.), got into a cab and went to Jekovac, a little park overlooking the old town. I took this shot from the same place, and you can see how foggy it was back in October 2007. This time around, the sky was clear, but the actual sunrise was ruined by some low-hanging clouds, so I didn’t get good shots until a few days later. I brought two film cameras to this trip, but one thing I wasn’t comfortable doing with them was long exposures. This was 8 seconds at ISO 100 with my Canon 20D digital camera; if I took a shot with my Velvia 50 film, it would have had to be 30+ seconds, due to film reciprocity failure. In the foreground is the Old Town, anchored by the City Hall, built in the 19th century by the Austrian Empire and later converted into a library, which was then burned down by Serbian military forces in 1992, in the first days of the Siege. Bottom right is the cemetery dedicated to the defenders of the city during the Siege. Further westward, you see the modern buildings of the newer parts of the city, and above, in a fortunate astronomical circumstance, you see the full Moon, about to plunge behind Igman and Bjelašnica mountains.